How to draw realistic face front view. Draw realistic face tutorial front view. This video tutorial show you how to draw a basic realistic face for all level. There are also a few more portrait video tutorials under the main video. Click on them to see more. 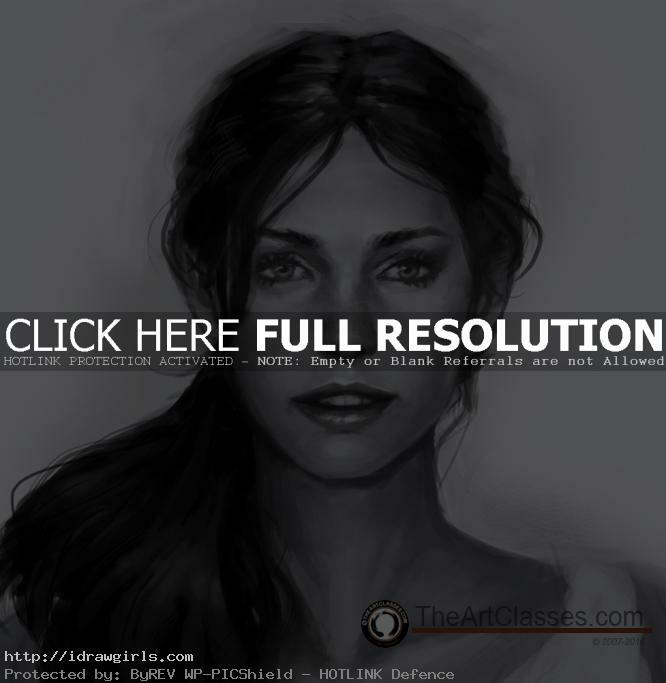 Below are step by step portrait drawing tutorial with explanation. The portrait study below, I use Wacom tablet to practice portrait drawing for digital art. In this one, I am trying to use just default round hard and soft in Photoshop, not using any fancy or custom brushes just to see if I can carry it to the end. Most of you ask, what kind of brush do I use. I used a lot of brushes, but that’s not the point. Most of the tutorials here that I made, I am trying to bring the principle to the audiences. and computers to communicate with our audiences. If you understand the principle of how all the terms mentioned above interact, and you can use them efficiently, then you can function at the best of your abilities and transform your thoughts onto any medium you wish. different lighting, mood or expressions. Now that you understand the importance of a good foundation, let’s begin! Here is a female front view portrait. 1) I started off with an egg shape but with a slightly angular bottom because I wanted her to have a strong jaw line. I laid out the flat skin color as a base (de-saturated pinkish or egg shell color; you can use any skin tone you prefer). Afterward, I marked spots for where I would put her eyes. I painted in the eye sockets because they are the part of the face that usually casts the strongest shadows, other than under the nose and under the upper lip. NOTE* There is a big jump from Step 1 to Step 2. 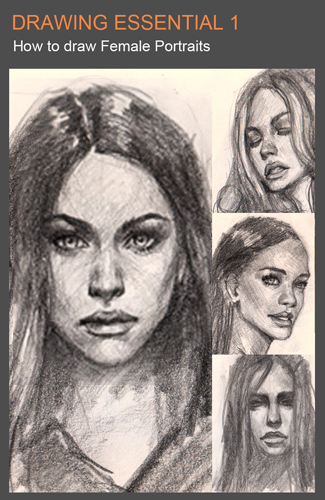 If you are wondering how to structure the facial features, go to my previous tutorial how to draw face. Once you’ve learned these very basic things the puzzle is solved! 2) In this stage, I added some very soft shadows all over her face, then some shadows all the way from under her cheek bone to her chin line to indicate a three dimensional object and establish the direction of the light source (the light is hitting from the front). I then went in to draw the outline of her eyes, eyebrows, nose tip, and lips. Although these lines are not here to stay, they are there to give me some sort of guideline so that I can accurately apply my paint. 3) Paint as if you are sculpting. The reason I placed soft shadows in the previous stage is so that I can pull out the light and give the portrait the illusion of a 3D object. I painted the lighter value of color over the area that the light source would hit. At this stage, don’t get caught up in details, just layout the simple shape and flat color. I put lighter values all along the bridge of her nose to the tip, her cheeks, the area above her upper lips, and her chin (these are the areas that will get hit directly by the light source I previously established). Notice that I also added some strong shadows on both sides of her nose bridge and darkened the eye socket a bit to accentuate the form that was given by the light source. it because most of the time you don’t really get to see them if you squint (you will have much better results if you practice more from live subjects than from photo references). However, for demonstration purposes, I will do them just for the hell of it. Notice I painted in only two values under the nose. Usually, I can get away with just one. 5) Then I looked for places where I could put darker shadows on her face to make her features more prominent such as dark lines in between her lips and more dark paint around her eye sockets and her eyebrows. 6) Now it’s time to tighten things up by finding places to put my darkest values onto the image: under her chin, under her eyebrows (sockets), and some on the side to create sharp edges for the painting. I also brought some light out in her eyes. 7) Tweak and refine the features here and there, no major value or hue changes, to tighten up or clean up a little more..
8) Now I lighted up her face a bit more by putting more light values to her nose tip, above her lips and a bit on her chin. 9) As the face is coming along and finally starting to look like a face, it’s time to bring out some detail and put some highlights on her. At this stage, I painted highlights in her irises, the tip of her nose and the edge of her upper lip. These areas get hit by the strongest light. 10) Refinement, clean up and finish up…in this case I darkened her eye lashes (adding shadows underneath), added some highlights on her lower lips, and touched up her nose. 11) Added some hair to her face and highlighted it to give it dimension. This one I painted using just the Default Round hard and soft brushes. more painted look and a larger variation of textures. 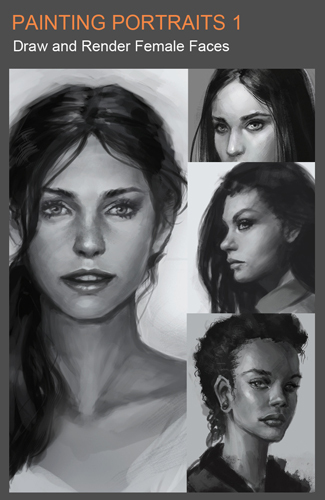 If you want more detail how to draw complete portraits from start structure to finished, I recommend getting these two premium tutorials. These tutorials have help many artists. If you are serious, either one will get you start and well beyond basic drawing or digital painting. Each video tutorial are more than two hours long with in dept instruction. If you are not happy with the tutorials, we will give you full refund. Business inquiry? Half deposit and half on delivery. E-mail me. How can I contact you to draw a portrait for me if I sent you a picture of someone? Did you read the article in this post? I only use default round hard and soft for this just to prove the point exactly. It is not the brushes! If you cannot do something decent using round brushes, no custom brushes can improve your art. 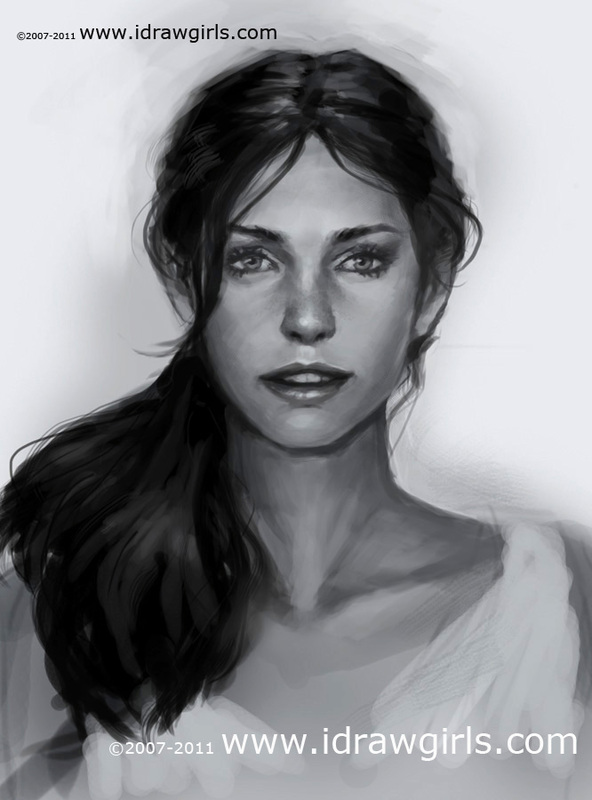 you get this question a lot probably, but what brushes do you use to paint portraits?